We visited the site of the new Larinier fish pass at the Mill Weir on the River Fergus at Ennis this week as part of an ongoing review we are providing for this site. Although this is not part of the Old River Shannon catchment, it is located in the Lower River Shannon Special Area of Conservation (SAC) and issues here are also relevant to our main study area. For example River lampreys produced in the River Fergus could easily end up returning to the Old River Shannon to spawn (for more on lamprey life cycles see here). 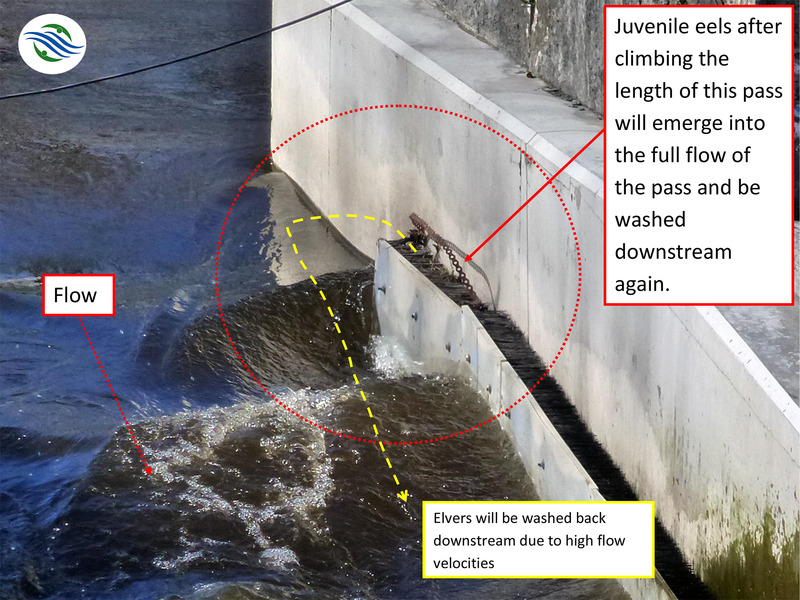 As we explained in a previous post, this new Larinier fish pass was essentially provided as a compensatory mitigation measure by the OPW to offset the damage to lamprey habitats in the Lower River Shannon Special Area of Conservation (SAC) that occurred as a result of the construction of the River Fergus Ennis (upper, Ennis) Drainage Scheme; and also to mitigate for the ongoing impacts on lampreys which are occurring due to the construction of the River Fergus (Lower) Drainage Scheme. However, as we pointed our previously, this drainage scheme project is in breach of the EU Habitats Directive and compensatory mitigation measures like this can only be prescribed with agreement of the EU Commission under Article 6(4) of the Habitats Directive. This Larinier fish pass was provided for lampreys in particular, but will be unlikely to work for two of the three species of lampreys that occur in the River Fergus and which are key conservation interests of the SAC. River lampreys are a key conservation interest of the Lower River Shannon Special Area of Conservation and only occur in the River Fergus downstream of this weir. 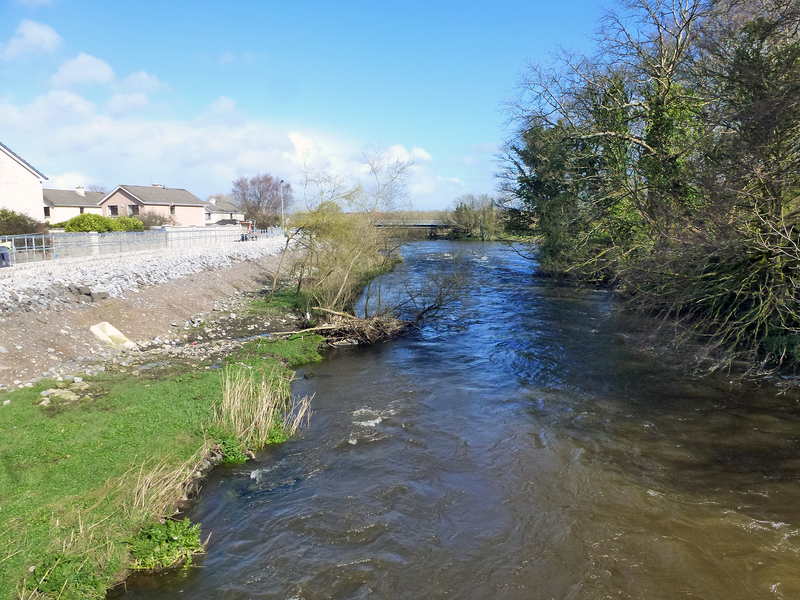 All juvenile lamprey nursery habitats were removed during the construction of the River Fergus (Upper, Ennis) Drainage scheme and there are ongoing impacts to lamprey populations as a result of the current construction works associated with the second phase of this OPW drainage scheme. As with river lampreys, sea lamprey habitats in the River Fergus at Ennis have been severely impacted on as a result of the construction of these OPW drainage schemes. Sea lampreys are likely to be able to use this pass under certain flows; but where are they going in this catchment? According to a recent report published by Inland Fisheries Ireland (Rooney et al, 2013) there is very little lamprey nursery habitat in the River Fergus upstream of Ennis so allowing sea lampreys to access further upstream in this river catchment is unlikely to improve the conservation status of this species in this river. According to Rooney et al (2013) “the exposed or bedrock limestone nature of much of the catchment resulted in limited sediment deposition conducive to juvenile [lamprey] habitat“. Most the juvenile lamprey habitat in the Fergus at Ennis has been destroyed as a result of these drainage schemes. The loss of these habitats, which threatens the survival of anadromous lampreys in this river, can be considered to be an integrity level impact on the Lower River Shannon SAC. Eels will have significant problems finding these brush passes and will also try to ascend through the gates, and also follow the old pass to the top where they will be faced with a small weir. European eel stocks have undergone a dramatic decline throughout the range of the species. In the National Parks and Wildlife Service ‘Red List’ of Freshwater Fish the European Eel Anguilla anguilla is rated as being ‘Critically Endangered’ (King et al, 2011). Eel habitats were also damaged in the lower River Fergus as a result of these drainage schemes. So will the fish pass work for eels? Juvenile eels generally cannot use Larinier passes, and they are well beyond the swimming capabilities of elvers in particular. 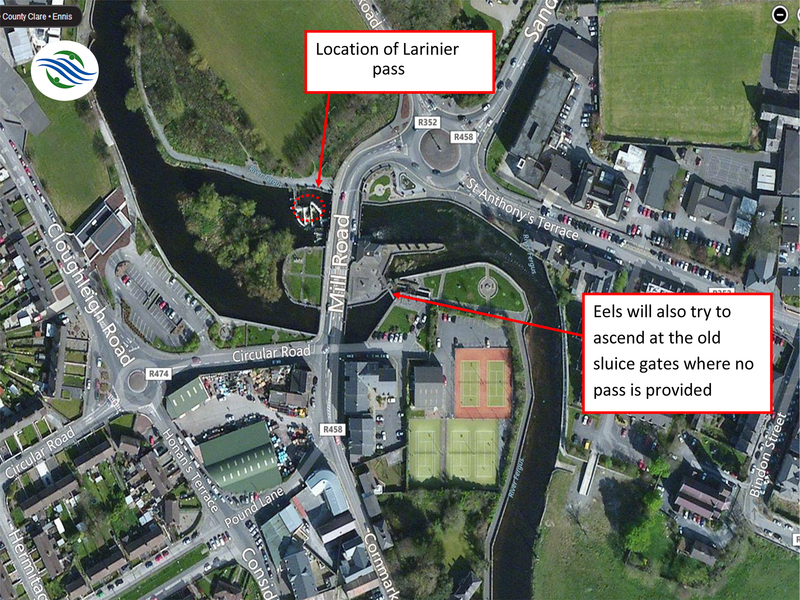 For this reason separate eel passes are usually included with Larinier passes and two separate eel passes, in the form of vertical brush boards, have been provided at the sides of this new Larinier fish pass in Ennis. But will they work for eels? For eels to use these brush passes they first have to find them. Eels then have to be able to climb the brushes to the top. At the top it is important that eels can swim out into an area of reduced flow to avoid being washed back down the pass to where they started. The exit at the top of the brush passes leads directly out into the fast flow, and eels having climbed to the top of this pass – with considerable effort and energy expenditure – will be cruelly washed back down the pass again. Turbulence will make the entrance to the eels passes difficult to find, eels will also be attracted into the dead end of the old fish pass. Eels will also try to ascend through the gates and other channels. Eels that do find the eel pass and climb upstream will be washed down again as a soon as they reach to top. This new fish pass at Ennis has too much turbulence at the entrance to the eel brush passes for eels to find it effectively. Eels will not know that this pass is there and they will not be able to see it. There is just too much ‘noise’ in terms of water turbulence going on here for eels to find this in a efficient way. The exit at the top of the brush passes leads directly out into the fast flow, and eels having climbed to the top of this pass – with considerable effort and energy expenditure – will be cruelly washed back down the pass again. They will then have to try to find the entrance again, climb to the top again and be washed down again. Eels will have significant problems finding these brush passes and will also try to ascend through the gates, and also follow the old pass to the top where they will be faced with a small weir. Eels cannot jump so will get trapped here. Eels will also attempt to follow the old Mill race but will be blocked from ascending here due to the presence of sluice gates. Eels will also try to access the other channel which goes under the bridge here, and there is no eel pass here and flows are too fast here for eels to ascend. There were also fish passage issues at this site for salmon and trout. It is understood that a salmon counter will also be installed here as part of this new fish pass. However, it is clear that at best this will only be partially used by salmon and provide a partial salmon count only. 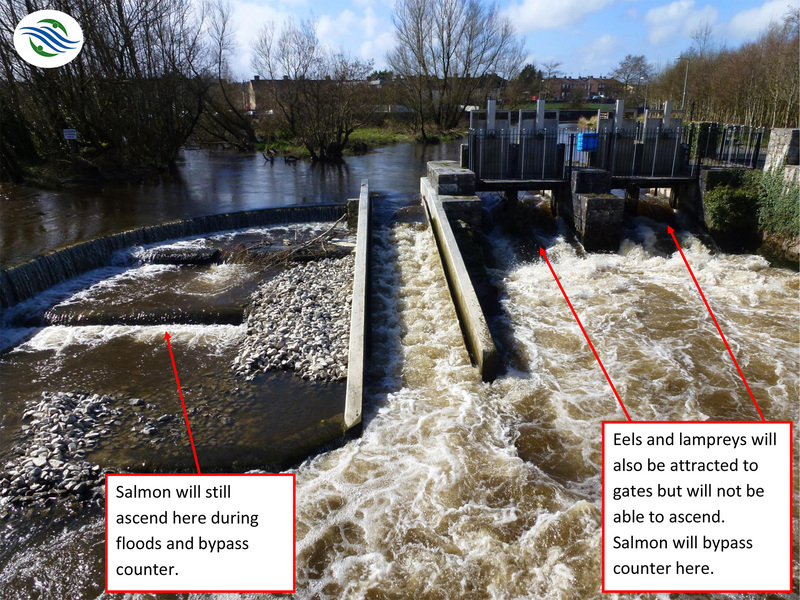 Salmon will continue to use the old fish pass, run under the regulating gates when they are open, and also run the over flow channel which extends under the Mill Bridge here. So we have a pass that won’t work effectively for lampreys, eels, or indeed salmon. We will have a fish counter that will only provide partial counts. 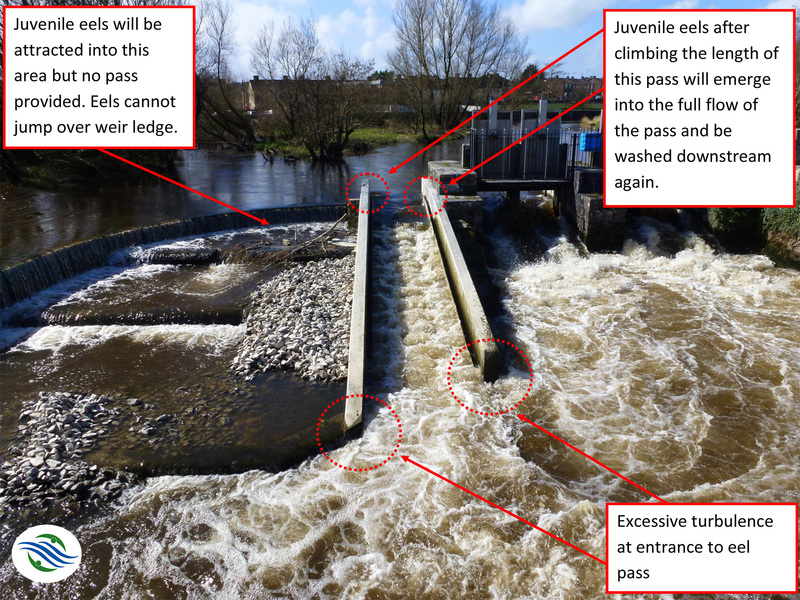 The OPW have a history of providing fish passes that do not work, for example Lacken Weir in Kilkenny. 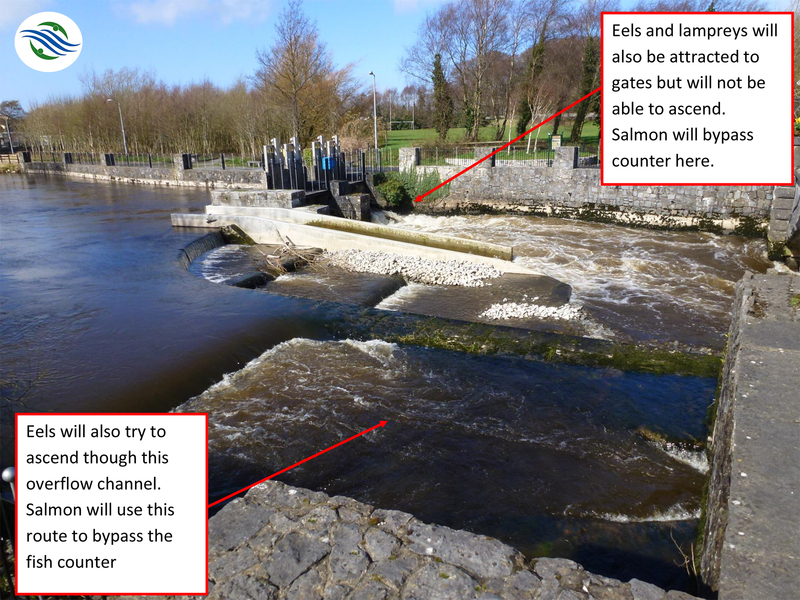 It is a shame that lessons are not being learned by this state body and we now have a fish pass in Ennis which will not work for river lampreys, will not work effectively for eels, along with a salmon counter which will at best provide a partial count only. We have a pass which will let sea lampreys up into a catchment where there is limited nursery habitat. In the meantime the OPW’s contractors continue to impact on what is left of the juvenile lamprey habitat in the River Fergus downstream of this weir, all within the Lower River Shannon SAC. The River Fergus (Lower) Drainage scheme is currently ongoing and there continues to be habitat loss and impacts within the SAC. In the photos below we can see a road that has been constructed along the River Fergus within the SAC boundary and has resulted in encroachment onto lamprey habitats and the loss of priority alluvial woodland habitat along the river. And what for? To provide a road and access. Unnecessary encroachment into the Lower River Shannon SAC as part of the Ennis (Lower) Drainage Scheme. This resulted in damage to lamprey habitats and loss of priority alluvial woodland habitat. The eel pass could be improved here by extending the vertical brush boards upstream and downstream. Other eel passes should be placed on the old weir and sluice gates. Eels passes can include strategically placed strands of geotextiles which can be used to help eels climb. For lampreys, there needs to be an instream habitat enhancement programme to try to reinstate the lamprey habitats which were lost due to the instream works that the OPW said would never happen. Draft designs for for such a physical enhancement programme for re-establishing juvenile lamprey habitats were previously drawn up. There has only been habitat damage and loss on the River Fergus as part of these OPW drainage schemes to date. Remember there is also no lamprey nursery habitat upstream from here according Rooney et al (2013). Where have IFI and NPWS been in relation to this issue of integrity level habitat loss for lampreys within an SAC? There is no where else for lampreys to go here, the habitats that were lost here will have to reinstated. To improve passage at the Mill Weir, more cobble/gravel could be backfilled into the old fish pass here. If this was done right with strategic use of geotextile matting and perhaps notches cut in the weir we could have a pass that would work well for eels. We would also need to do something at the sluice gates and overflow channel to assist eels and lampreys. Water management has always been important at this site in relation to fish passage. It will be just as important with this new pass to ensure that the sluice gates here are managed in way sensitive to fish passage requirements. Whether the salmon counter that will be installed here works or not it does not seem to matter in Ireland. Inland Fisheries Ireland never publish any results from these anyway. The counter here will be likely to be nothing new in this regard. 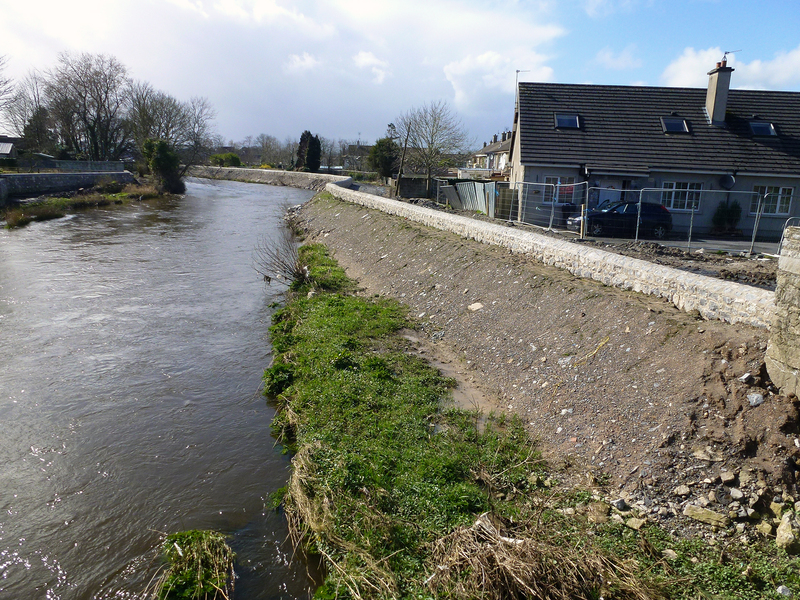 New fish pass at Ennis – enough to mitigate for integrity damage to SAC? Is anyone really protecting lampreys in Ireland? King, J.L., Marnell, F., Kingston, N., Rosell, R., Boylan, P., Caffrey, J.M., FitzPatrick, Ú., Gargan, P.G., Kelly, F.L., O’Grady, M.F., Poole, R., Roche, W.K. & Cassidy, D. (2011) Ireland Red List No. 5: Amphibians, Reptiles & Freshwater Fish. National Parks and Wildlife Service, Department of Arts, Heritage and the Gaeltacht, Dublin, Ireland. Rooney, S.M., O’Gorman, N.M., King, J.J. (2013) National Programme: Habitats Directive and Red Data Book Species Executive Report 2012. Inland Fisheries Ireland, Swords Business Campus, Swords, Co. Dublin, Ireland. As an angler for many years, and living in Ennis for the last 10 years right beside the river Fergus and also acutely aware and active of conservation of our fish in this country, I would like to point out that the “ROAD” as you have said in your article is a footpath leading from the main road to the slipway just before the railway bridge, and has always been there since I and my parents can remember, my parents having lived in the house since construction in 1986, other than that slight mistake keep up the good work. Thanks for your comments Paul. What has been put in here is more substantial than what was here before. This is apparent from the photos in the article. We have before photos from here also. Why are there no salmon in the upper River Shannon?